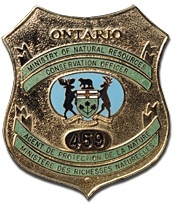 $5,500 Fine, Licence Suspension and Probation for Hunting Offences. Corby Knight pleaded guilty and was fined $1,500 for careless use of a firearm, $1,000 for unlawfully hunting deer at night, $500 for unlawfully possessing an unencased firearm at night and $1,000 for hunting deer during the closed season. His shotgun, rifle, gun case and ammunition were permanently forfeited to the Crown. ← Lake Nipissing Walleye Over Limit Proves Costly.